Posted on February 08,2019 by Charlie Stimpson. If you like your home to have a contemporary look and feel, then you will not necessarily want traditional fencing to finish off the exterior of your property. Of course, you will also want your fence to add some security to your property and protect your home and garden, so it is important to choose a fence style that can do both. Here are just a few ideas to suit your needs. You may think that picket fencing is an odd choice in terms of contemporary fencing, simply because it’s usually the fence of choice for country cottages and can therefore be thought of as a little twee. However, it’s important to remember that it doesn’t have to be traditional white picket fencing; picket fencing can be stained a dark brown or black to give a smart, modern finish to the border of your property. Although by no means a new choice for homeowners, close board fencing is one of the smartest choices you can make when it comes to fencing. Its sleek finish instantly adds a contemporary feel to your fencing, and the fact that it comes in different heights means that it’s a suitable choice for both front and back gardens. It’s also a great choice in terms of security because of its durability. If you want to add some interest to your close board fencing, then ask your fencing company about finishing the fencing with a trellis topper. This is a great way of adding a little something different to the finish of your garden but which still has a contemporary look and feel to it. 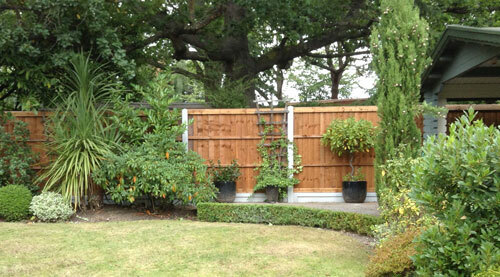 If you want to zone your garden in a contemporary fashion, then trellis screening is a very modern choice. It’s a bold look in some ways, as it will stand out within your garden, but if you want to add some interest into an otherwise aesthetically unpleasant space, then it’s a great choice. This is more a decorative choice than one made for security reasons, so it may not suit every garden or situation. However, it’s a great choice if you need to hide something within your garden and would still like a contemporary look or feel to a practical solution. For all your fencing needs, both contemporary and traditional, contact D&G Fencing. We can install fencing in gardens across Hornchurch, Brentwood and Upminster to create a modern finish to the exterior of your home.